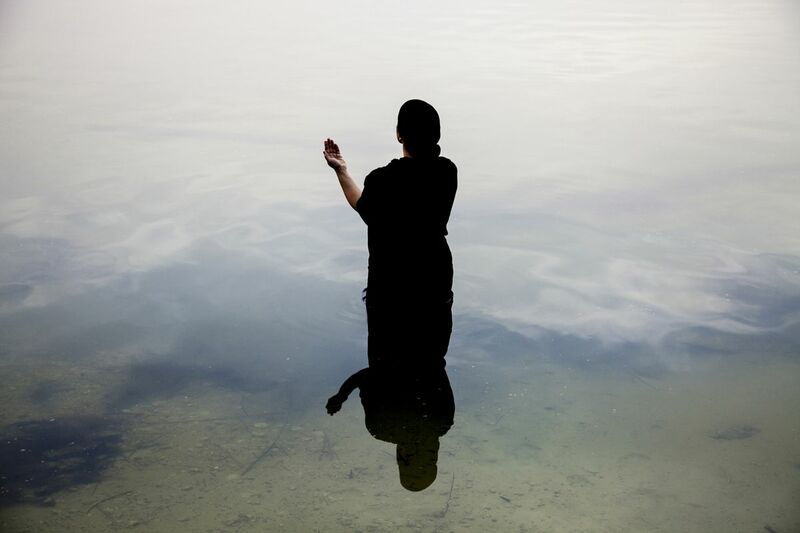 Sama Alshaibi presents works from her Silsila series at the Herbert F. Johnson Museum of Art in a solo exhibition running until 24 December 2017, consisting of a series of photographs and video works. Named for the Arabic word silsila, or ‘link’, the exhibition explores the joining of individuals to one another, humans with the natural world, and the self to the divine. Inspired by the nomadic traditions of Bedouins and the writings of fourteenth century Moroccan explorer Ibn Battuta, Silsila depicts the artist’s journey through the significant desert areas and bodies of water that connect North Africa and West Asia to the Maldives, an island nation located in the Arabian Sea and the Indian Ocean, threatened by rising sea levels. Performing at various sites, Alshaibi has composed a body of work that describes the desert as a place of enduring paradox. As Alshaibi demonstrates with visual poetics and laden imagery, the desert can serve as the starting point for a broader cultural reading, revealing the mystical and historical importance of such environments, through which the region, even more broadly, the world, can re-imagine an uncertain ecological future.